A disappointing 2nd half collapse saw the exiles on the wrong end of a thrashing for the 2nd time this season. 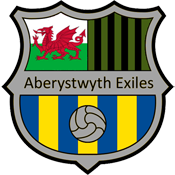 In a competitive first half the exiles came close on several occasions to taking the lead, with the Glamorgan keeper denying Peacock and Evans, but after Glamorgan went ahead, there was only one winner. Much improvement needed.